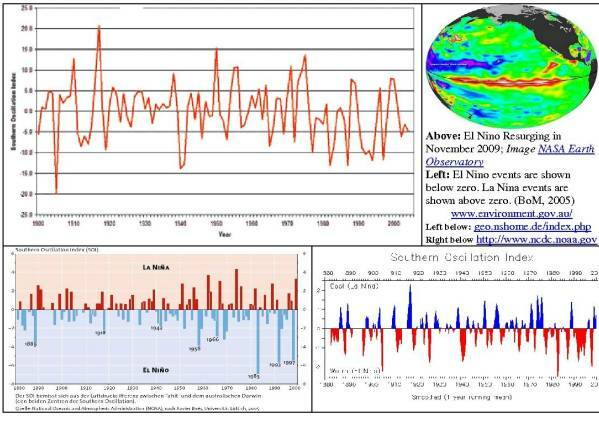 Is the assumed 1939-42 El Niño well enough understood to base conclusions on it? The Figures: The randomly selected figures shown all that the early 1940s had El Niño, but they vary considerably with regard to the exact period, and particularly concerning the intensity. However, by all means, they can hardly be regarded as exceptional and unusual. Discussion: During 1940–42, exceptional climate conditions occurred around the globe, including a series of intensely cold European (W.J. Randel (2004), Nature Vol. 431), which associated with the large El Niño of 1940–42. But did such ‘prolonged’ event actually occurred? According Diaz & Kiladis (1992) there was only an El Niño event in 1939 only followed by the next in 1951. Other sources claim the such events took place “1939–1941”, or “1939-1940 and 1941-1942”, which is rather unspecific as well. Although the assumption of a prolonged event would be an absolute exception in the recorded El Niño history during the last 150 years, there is little hesitation to take a several years event for granted, to link it the exceptional weather events in the Northern Hemisphere during the war years 1939-1942. Comment: It is easy to prove that an El Niño event occurred in summer 1939 when Peru had had the highest rain for more than 20 years. At that time little was know about this phenomenon, and later the historical identification of events had been primarily based on recorded sea surface temperature data. While such data had had their limits prior WWII they should be regarded a largely as unreliable in many respect due to the war situation (see reference below). In addition, it is physically highly unlikely that an El Niño is active over a prolonged time period, but occurs Niño infrequently in time intervals of a couple of years. It requires a shallow ‘pool’ of warm water that to cross the Central Pacific form the West Philippines) to the coast of Central South America. There it covers for a couple of months the cold water current from the Antarctic until the ‘pool’ is “consumed” even out by mixing with the colder water. While the cold water current from the south is the prevailing condition along the coast of South America, the ‘pool’ is a single event and not a current. Any claim of a ‘prolonged’ event should proved convincing proof before any subsequent correlations are discussed. The exceptional climate conditions during WWII should be no exception.